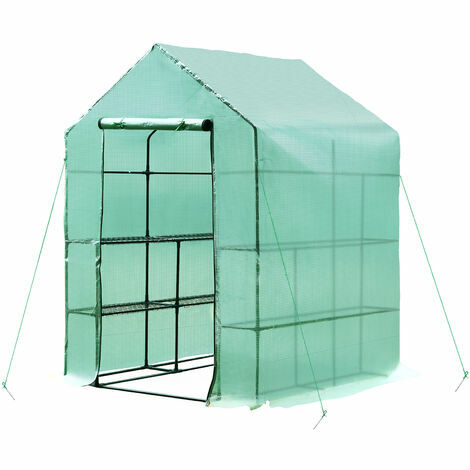 Features: -Reinforced 140 g/m² green PE gridding fabric ensures the cover durable. -Anti-UV, translucent. -3-tier shelf on each side for plants display and storage -Dark green powder coated Ø 16mm steel tube, hardy and durable. -Full ground bar and support bar on both sides, stable and sturdy -Diagonal storm bracing bars inside make the whole configuration more firm and everlasting. - Removable cover with 2 front zips for easy ventilation -At bottom, there is 10cm redundant cover for that soil can press on it to prevent storm and ensure obturation. -Offer a usable and 4 cubic meters vacancy and space. -Easy assembly and easy to clean.